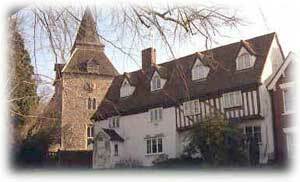 The Finchingfield and Cornish Hall End Parish Council Website can be found here. Cliff Lawson's Finchingfield page has more information and links. His guestbook will be of particular interest to USAF personnel who were stationed at nearby Wethersfield airbase. The history and restoration of the Guildhall feature on this site. Essex County Council have a page about the windmill which includes contact details to arrange for group and school visits. The village's Post Office and Store has a site with details of the services they provide. Finchingfield Cricket Club was restarted in 2006 and information about fixtures, etc. can be found here. Further information about the area can be found at the Braintree District Council site. Also see the ANY-Village website for Finchingfield. Folk with USAF connections should visit a site devoted to RAF Wethersfield. There are lots of photos and a guestbook, plus useful links. Finchingfield's church provides a focal point for many pictures of the village, but Essex has many other attractive churches. John Whitworth's site aims to picture them all! The Colne-Stour Countryside Association aims to monitor rural planning and development, and to protect the area's rural scenery and amenities. If your site includes pictures of, or information about, the village please send me details so that I can add a link. Click here to email me. Last updated 20th August 2015.